It was the packaging that got me first. Matte black with a jagged geometric diamond design in holographic silver; it looks so gorgeous when it catches the light. The box is a complete contrast, with shades of soft pink and peach. And then there are the shadows themselves. Gold, rose gold, powders, creams… everything you need in a festive eyeshadow palette. There’s even a double-ended brush, and one of the ends is an actual brush instead of a disappointing sponge. As we all do from time to time, I popped the extra make-up I didn’t need in my basket and went on my way. The Sleek i-Lust palette is my first impulse buy in a while and since it’s limited edition I decided to share my initial impressions, just in case you’re tempted to try it before it disappears! I wore the shadows as part of my make-up for an evening thing with my friends and was impressed with how long-lasting they are. I applied them mid-afternoon and they were still intact when I took them off at midnight, so top marks. 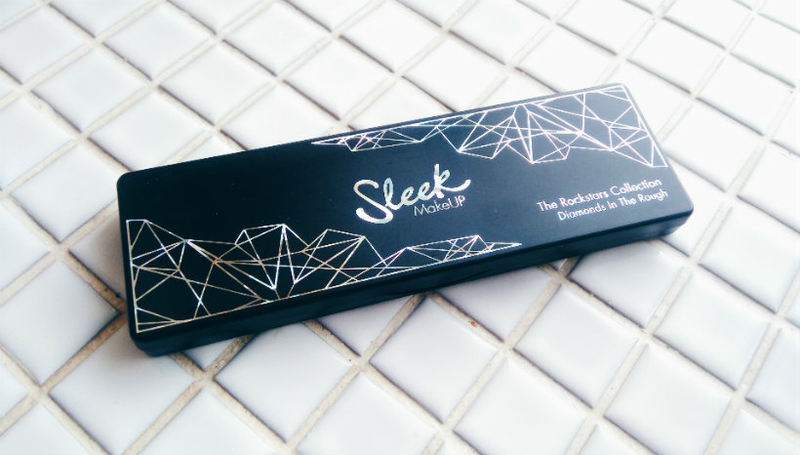 I don’t believe you can beat Sleek when it comes to high street eyeshadows — they’re always incredibly pigmented, with minimal fallout. I would have liked the powder eyeshadows to be a little more buttery, but the creams are nice and smooth. Both of them apply evenly with various eyeshadow brushes so you really can’t go wrong. Left-right: Solitaire, Trillion, Princess, Asscher, Marquise, Radiant. On to the individual shades. There are two creams — Solitaire and Radiant — and four powders — Trillion, Princess, Asscher, and Marquise. The champagne shade (Solitaire), pink shade (Princess), and gold shades (Trillion and Radiant) all apply pretty much as they appear in the palette. They don’t deceive you. But the rose gold and copper shades (Asscher and Marquise) looked kinda orange on me, creating a sunset effect instead of the golden bronze eye I was hoping for. Basically, the shades are a bit hit and miss, but £7.99 for a decent palette isn’t to be sniffed at! Have you made any impulse buys recently? Let me know in the comments!